Please note that this project is community driven and is not an official Mapbox product. We welcome feedback and contributions. 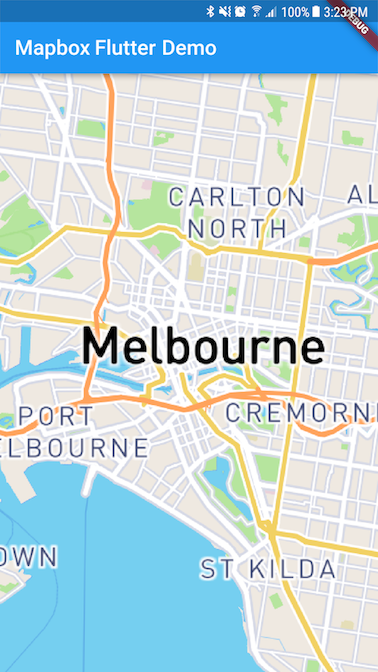 This Flutter plugin for mapbox-gl-native enables embedded interactive and customizable vector maps inside a Flutter widget by embedding Android and iOS views. This project is available on pub.dartlang, follow the instructions to integrate a package into your flutter application. This project uses Mapbox vector tiles, which requires a Mapbox account and a Mapbox access token. Obtain a free access token on your Mapbox account page. This README file currently houses all of the documentation for this Flutter project. Please visit mapbox.com/android-docs if you'd like more information about the Mapbox Maps SDK for Android and mapbox.com/ios-sdk for more information about the Mapbox Maps SDK for iOS. Need help with your code? : Look for previous questions on the #mapbox tag — or ask a new question. Have a bug to report? Open an issue. If possible, include a full log and information which shows the issue. Have a feature request? Open an issue. Tell us what the feature should do and why you want the feature. This repository's example library is currently the best place for you to find reference code for this project. We welcome contributions to this repository! If you're interested in helping build this Mapbox/Flutter integration, please read the contribution guide to learn how to get started. Demonstrates how to use the mapbox_gl plugin. Run flutter format to format lib/src/camera.dart. Run flutter format to format lib/src/circle.dart. A Flutter plugin for integrating Mapbox Maps SDK inside a Flutter widget in iOS and Android applications.